Mellowhead, Software Amp Simulator from Mellowmuse. MellowMuse has announced that Mellowhead, its guitar and fx modeling plug-in, is now available as a VST effect plug-in for Windows. 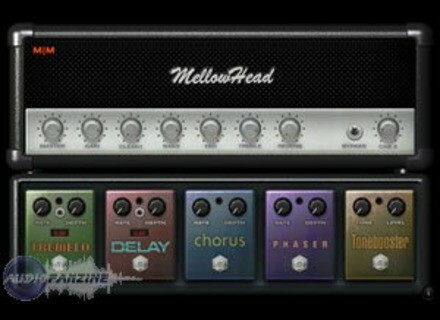 MellowheadMellowhead is a guitar and fx modeling plug-in. The emphasis here is on creating the raw organic sound of a mic'ed tube amp. There are 10 convolution based speaker cabinets and 10 different pre-amp/tone settings, ranging from clean to hard distortion, as well as 3 band tone controls. The 5 effects pedals, reverb and cabinet bypass allow further creative shaping of your guitar sound. CPU has been kept as low, so multiple instances wont bring your DAW to its knees, Mellowhead produces no additional latency to hamper your playing. * 10 convolution based guitar cabinets. * 5 effects pedals, Tremolo, Delay, Chorus, Phaser and Tone Booster. * Capable of a wide range of tones from clean to heavy overdriven tube amp sounds. * Bass, Mid, Treble tone controls. * Separate master and pre-amp gain controls. 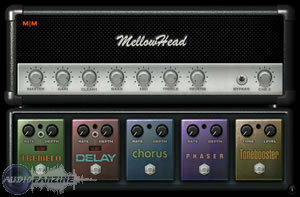 Priced at $49, Mellowhead is now available for Windows and Mac OS X in VST and AU plug-in formats. Demo versions are available. Fxpansion Japanese Taiko Percussion FXpansion introduces the latest addition to the BFD2 expansion pack range, Japanese Taiko Percussion. Sugar Bytes Consequence - The Chord Synquencer Sugar Bytes has announced the release of Consequence - The Chord Synquencer. Voxengo LF Max Punch Voxengo has announced the release of LF Max Punch, an audio effect plug-in for music and sounds where low-frequency thump and punch are welcome, and where distortion is applied specifically to bring the bass sound to life.